I feel like this review is very overdue here on my blog. 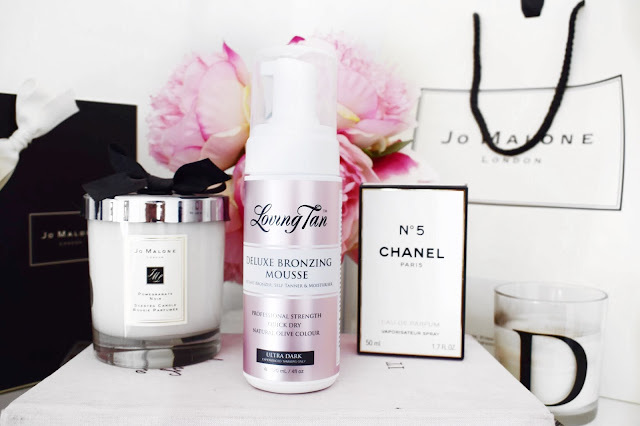 I have been using Loving Tan for quite a while now and I feel like I am just about ready to be sharing my thoughts with you guys. 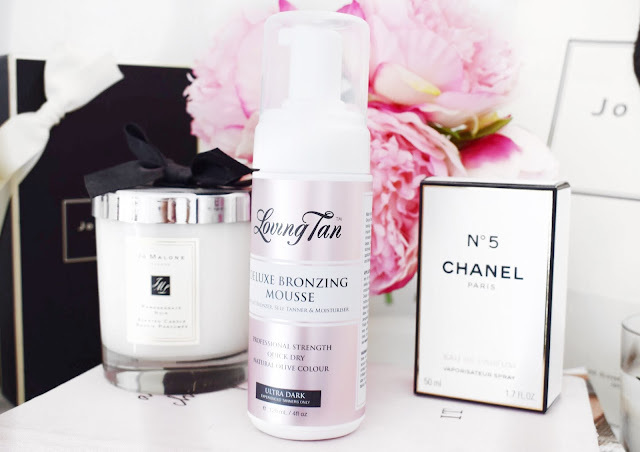 When it comes to something like a fake tan, I like to try it out for months before I upload my review because I want to know the ins and outs of it and how it performs in different environments and under different circumstances. For a long time, I have been very unsure about this and I stuck with it in order to get this review up for people because I know that it is a product that spikes a lot of interest for hell of a lot of people. I am sure that most of you guys will have seen this mentioned in countless beauty YouTubers videos. It seems like everybody and their mothers uses this fake tan and they all have a coupon code for you to get a little discount. For the past couple of years, I have toyed with the idea of buying this and trying it out for myself, but whilst I am on the Loving Tan website I think about the customs fees when it is delivered, and I always back out. Over the past couple of years, a couple different UK companies have stocked this for a short amount of time and then they stop selling it. I bought this from a company called Loving Tan Islington, which is a London based stockist. When I bought this product from the moment it was delivered, I could see from the outside of the jiffy bag that it had leaked. I opened up the bag and there was fake tan everywhere, it was an absolute disaster. I washed it off and it looked like the top of the bottle had cracked and 90% of the tan itself had gone. I tried to contact them by email, telephone and in the end, I had to WhatsApp them in order to get a response. I will say that when I did speak to somebody they were very helpful, I just seemed to be going around in circles actually trying to speak to somebody. Now onto the actual fake tan itself. I wanted to try this because I had heard everywhere that this was the world's best fake tan, it didn’t have a fake tan smell, the colour was stunning, and olive and it lasted really well on the skin. They are pretty big claims for a fake tan and that is everything that I need in a sunless tanner, so I really couldn’t wait to try it out for myself. Before I used this for the first time, I made sure that I had scrubbed every scrap of fake tan off my skin, exfoliate and moisturise before I went in with my first layer of fake tan. I feel like I should start by explaining that before I bought this fake tan, I normally use the Bondi Sands tanner in the shade Ultra Dark. I really like this fake tan actually and it is my favourite out of all the ones that I have tried recently including St Tropez and St Moriz. My only issue with Bondi Sands and the reason why I wanted to try Loving Tan in the first place was because it is said to be a perfect olive tan and not go orange in the slightest, which can be a slight issue on my first morning after using the Bondi Sands. The first thing that I noticed when I pumped this out onto my tanning mitt was that it is very red in tone. Other fake tans that I have used have had a dark brown colour guard, but this one was straight up red. I guess that doesn’t really matter because it is just a colour guard, it is just very different to what I am used to. The other thing that I noticed when I first started to apply this product was that it is very nice and moisturising on the skin. As I applied this to the skin, it seemed to blend in really smoothly and evenly, it also left my skin feeling really hydrated and healthy straight away. Once I have applied my layer of fake tan, I usually just lay in bed and wait for it to develop. Usually I leave my fake tan to develop overnight whilst I am asleep because it stops me from getting it on my clothes or pyjamas. I will say, that this tanner did seem to settle into my skin very quickly and I didn’t feel like I was sticky or tacky and like my skin was clogged up with fake tan. It literally felt like I had just applied my night time moisturiser and it was a very lovely feeling on the skin. One thing that I do have to mention is that it did have the classic fake tan smell even though most people said that it doesn’t smell, compared to the Bondi Sands that smells like coconut, this is a typical fake tan smell. I also feel like I should mention that I could smell it all of the following day on myself. The next day after I washed the top layer off, I will admit that it was a very lovely colour. Would I say that it differs that much from my usual fake tan? No. It was a very similar tan and even with moisturising dry areas, you could still tell that it was fake tan and not a natural glow. I found that it lasted really nicely on the skin and the colour still showed after 4-5 showers. I would say that is an improvement on my Bondi Sands, but is it enough to make me want to fork out for the Loving Tan each time I am running low? I just don’t know. I have to admit that Loving Tan is a brand that I have really been enjoying using. I think that it applied really nicely to the skin, it soaked straight in and didn’t feel uncomfortable, the colour was beautiful, and it lasted like a dream. But, I have to admit that my Bondi Sands is also a very similar product that performs really well and is significantly cheaper and you get more product in the bottle. I do like this Loving Tan fake tan in Ultra Dark and I am going to continue to use it, but I won’t make it the only fake tan on my shelf. Make sure to leave me a comment down below and let me know if you have tried this fake tan and what you thought about it! I love Bondi Sands too, if this has the classic smell it's probably not for me either. I would say that this is quite similar to the Bondi Sands with the scent! Honestly, it is absolutely amazing! It really is so hard, I have to scrub so much! It really is a great tanner! I never really thought about self-tanning until this year but my sister and I decided to try it and it was really fun! We use the Bondi Sands express one and I haven't had any issues with it (except I smell like chlorine after washing it off). I love Bondi Sands, it is a great cheaper fake tan! I am completely obsessed with it! Looks like a nice tan. Summers I'm all about having that bronze look. It really is, even in the winter for me! Oh it sounds brilliant. I really need to give Bondi Sands a go! That is a great self tanner at a reasonable price compared to this one! It is an amazing tanner and smells amazing! Love this post! Bondi Sands is my go to tanner! For some reason no other product works for me the way it does and it's also nice to shop locally. Such great memories from when I lived in Bondi! It is amazing Bondi Sands for the money!